Since the Jacobsen Track is no longer maintained, you can no longer drive a 4WD or Motorbike the full length of the track. It's best to drive as far as you can along the track and hike the rest. Secateurs are recommended for cutting through the Lantana, spiky Solanums, Lawyer Cane (Calamus australis) and Fishtail Lawyer Cane (Calamus caryotoides). You may also want to wear gaiters to help prevent the spread of seeds and burrs that would usually stick to your socks. Take caution when walking and lookout for snakes. You'll need to contact the land owner for permission and request permission to pass through their private property. 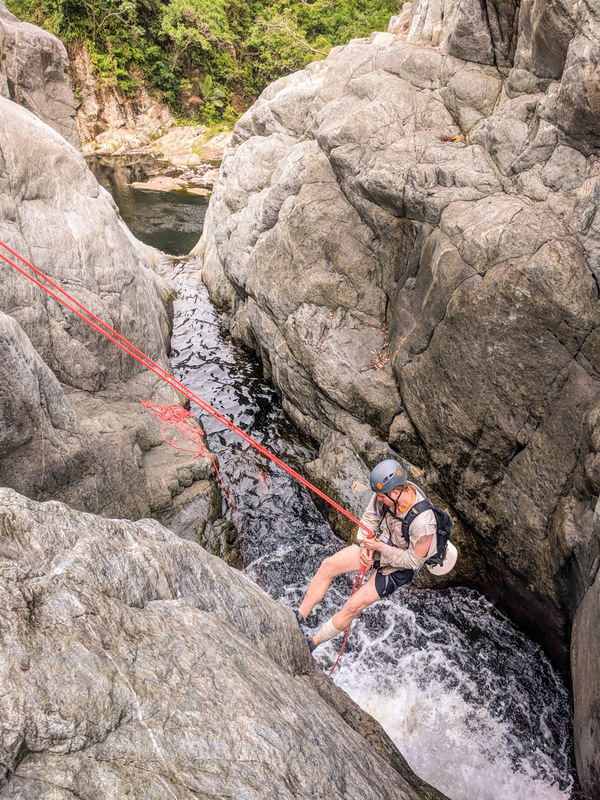 As you will be abseiling down waterfalls and into pools of water, you will get wet and will need a dry bag and appropriate clothing & experience. You'll need to be fit, capable & have your own gear (listed below). Although I consider this adventure relatively straightforward and easy, I recommend keeping your bag as light as possible. Drop cars at Jourama Falls car park and drive up the range. Two raps down into "blackhole"
The walk is about 16 km in total. On unmaintained track for about 11.5 km of it and in the creek for the other 4 km. It will take all day. The car shuttle will take approximately 2:30 hours either side of the journey. You will only get home after dark, so don't expect to be home before 7pm. You could also do a loop and head up the Jacobsen Track from the Bruce Highway side. I suggest you meet at the Deeragun petrol station at 5:30am and arrange car shuttles there (depending on how many people opt-in). about 1L of water for the walk in. The water in the creek should fine to drink. I drink the water without sterilising it but do so at your own risk. You may also want to keep a bottle of water in the car at the bottom. Sun protection (hat, long sleeve shirt recommended, I like wearing shorts for easier movement), sunscreen. The creekbed is mostly open - so it's sunny. Shoes; I recommend shoes that have grip on wet granite rocks and drain & dry quickly. I usually wear joggers. Can take two pairs of shoes, one for the wet stuff and the other for rock hopping - it's up to you. Secateurs for cutting vines, lantana and other vegetation. 70m dry canyoning rope recommended. All pitches have been bolted. A harness, rappel / belay device, prusik and carabiner as an extra safety precaution. A headlight (+ spare torch) in case we take too long again. You should consider cancelling this trip if it rains in which case you could just bushwalk to the top of Jourama Falls... or relax at home, have a beer, read a book or watch Netflix like normal people do. It's quite nice to camp at the top of Jourama Falls. There are two bolts placed on top of the cliff on the right-hand side of the creek. They are easily accessible and take you down into the pool of water below. Two bolts on left-hand side of canyon. 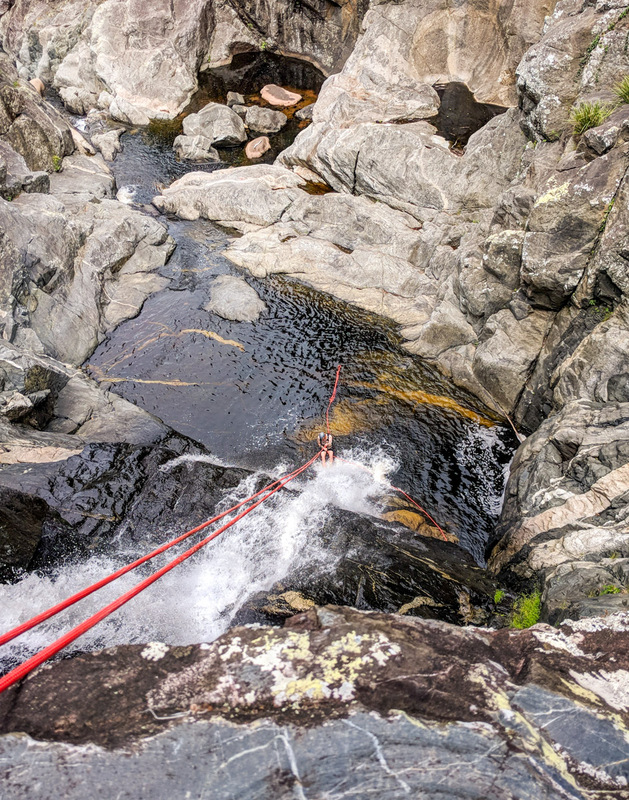 A 70m (Halved - so 35m abseil) rope is needed for this rap which takes your down to waterfalls and lands you just on the lowest ledge right next to the water - you can step from this ledge to the nearby dry rocks. Long swim across to the rocks. For raps 3 to 7 please read the Abseiling down Jourama Falls article. Townsville Town Common Conservation Park and Cape Pallarenda Conservation Park borders the ocean and is full of places to go and things to do for those who love a breakaway from it all.